This unassuming restaurant located next to a Motel 6 parking lot in Santa Clara might be the fanciest Korean restaurant in the Bay Area. The vibe here is definitely classy; I love the private rooms with sliding bamboo doors off to the side that make you feel like you’re in the middle of a Chow Yun Fat gangster movie from the 80s. The food is incredibly intricate and well prepared too, and ranges from the delicate miso black cod that comes in a sizable portion of 4 pieces, to the thick cuts of pork belly and squid bulgogi, to their unique take on seafood pancakes topped with crispy fried noodles. And that isn’t even mentioning the amazing barbecue carefully prepared at your table by an attendant. At the end of the meal, they even have a complimentary seasonal dessert soup that always hits the spot. The only downside to this place is how popular it is — you definitely want to call and make a reservation ahead of time. Kunjip is another Korean restaurant in Santa Clara located a few blocks off the main Koreatown stretch of El Camino Real. They don’t have an extensive menu, instead specializing in two popular dishes: naengmyeon and galbi jiim. The first, naengmyeon, literally means “cold noodles”, and consists of long thin buckwheat noodles in a tangy iced broth. The noodles are accompanied by an assortment of garnishes like julienned cucumber, slices of Korean pear, boiled egg, and slices of beef. Diners add a spicy mustard sauce to the soup to bring all of the flavors together. It probably sounds strange to eat an ice cold noodle soup, but on a blazing hot Silicon Valley summer day there’s nothing more refreshing. The second dish, galbi jjim, is a stew of fall-off-the bone tender beef ribs cooked in a savory broth. It’s definitely more accessible for those who find freezing cold noodles a bit too exotic. Yes, Bonchon is a chain, with locations throughout Mountain View, Sunnyvale, San Jose, and all the way up the Peninsula to San Francisco. But there’s a reason Bonchons are popping up all over the Bay Area like Starbucks: their fried chicken is simply amazing, whether drenched in tangy spicy sauce or glistening with savory soy garlic sauce. The rest of their menu has fun fusion dishes like Chinese inspired pork buns and Mexican inspired Korean tacos. If you haven’t indulged in the deliciousness that is Bonchon yet, don’t worry — at the rate at which they’re expanding, if you live in Silicon Valley, a Bonchon will probably open up within a block of you sometime in the next three months. Sometimes you just need to drown your entire consciousness in mountainous slabs of meat. When those times come around, you can always count on all you can eat Korean barbecue. 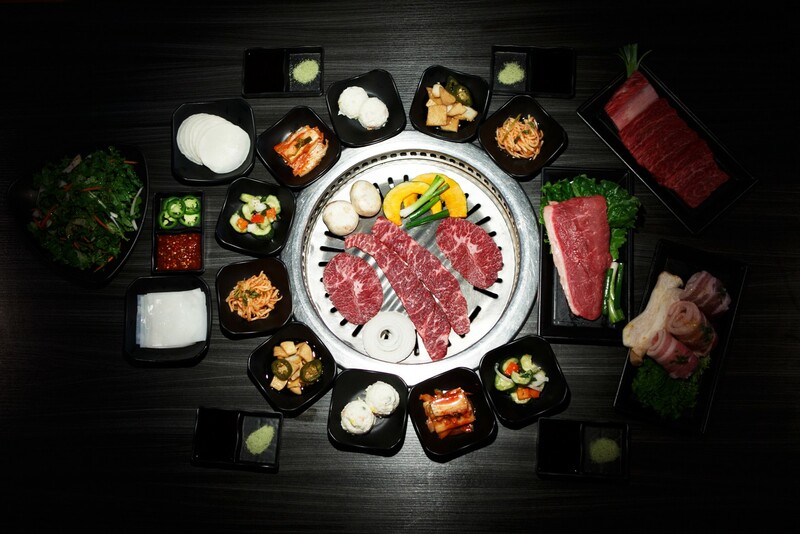 When LA-based chain Gen Korean BBQ opened a location in North San Jose, Silicon Valley finally had a place to be deluged by delicious animal protein. From pork jowl to their unique fusion Cajun pork belly to their signature short rib, you can’t go wrong with any of the choices on the AYCE menu here. My personal favorite for meaty excess is the cheese stuffed pork cutlet (yes, you read that right, and yes, it’s as glorious as it sounds). There’s now a second Gen located in Westgate shopping mall, but like the original, there’s usually a line out the door. Like the Paris Baguettes popping up all over Silicon Valley, Big Mug is a Korean coffee shop that might not seem particularly Korean. Once you’re inside though, you’d probably notice a few Korean snacks on offer, like the delicious bingsu shaved ice desserts. Big Mug’s bingsu is always a wise choice, but my favorite snack there is the avocado toast. Millennial jokes aside, the avocado toast at Big Mug may be the only rendition actually worth spending ten dollars on, seeing as it’s smeared with copious amounts of avocado and egg slices and garnished with almonds. Trust me, after trying the avocado toast here, you’ll never think of it as a joke again. Located in the middle of a strip mall in Santa Clara’s Koreatown, Jang Su Jang has been a mainstay in Silicon Valley for years. The food is solid, with an extensive menu covering all sorts of classic Korean dishes, and they don’t skimp on the side dishes. One of my favorite menu items here is the bossam, slices of pork belly just waiting to be smeared in a garlicky lightly spiced sauce and wrapped in sheets of lettuce. The sundubu tofu stew always hits the spot, making this one of the few Korean restaurants you can comfortably take your vegetarian friends to. And this Korean restaurant is the rare one open on Sundays, another reason why it’s a dependable choice. While Silicon Valley can’t compete with the famously amazing Korean food in LA, these days some of that culinary talent is migrating up to the Bay. Whether you’re getting cold noodles or barbecue or tofu soup, there are some great places for Korean food hidden between the office parks and hardware companies in Santa Clara and throughout the rest of Silicon Valley.